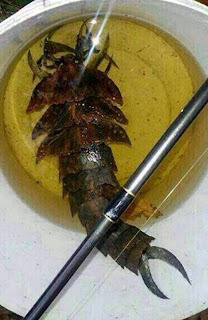 Where else but on the internet are you ever likely to encounter a creature as bizarre in appearance as the specimen depicted in the above photograph – unless, that is, it turned up in a river located within the Sultanate of Brunei? This small independent sovereign state situated in northwestern Borneo tends to be more famous for its extensive petroleum and gas fields and its mega-wealthy ruler, one of the world's richest men, than for any freshwater cryptids. All of that may change, however, if this ShukerNature post's mystery beast is ever confirmed to be genuine – but is it? I first learned of the entity that I have herewith dubbed the Beast of Brunei on 14 December 2013, when fellow British cryptozoological researcher Richard Muirhead placed on the wall of the Facebook Cryptozoology Group a clickable link to a page (at http://www.projectnoah.org/spottings/124556003) that he had spotted earlier on the website of Project Noah. This website encourages persons to upload photos of any animal whose taxonomic identity they wish to discover. On the page spotted by Richard was the photograph that heads this current ShukerNature article, together with only the briefest, single-line account by the person who had posted the photo there, and who is based in Brunei. The person's user name is Hazwan (but no real name or biographical details are present), who claimed: "Someone caught this during fishing", and then asked what it was. Hazwan also claimed that the photo had been obtained on 11 December, and had been posted by him/her that same day on this Project Noah page. In addition, Hazwan stated that the coordinates of the location where the creature had been photographed were Lat: 4.97 Long: 114.90. This is near the coast within Brunei's capital, Bandar Seri Begawan. The armoured anomaly present inside what looked like a white bucket or similar vessel containing some yellowish water was certainly very unfamiliar in appearance, and the lack of anything in the photograph that could provide a scale to gauge its size only served to heighten the mystery surrounding it. On first sight, it looked like some bizarre form of crustacean, but it seems to lack the sizeable number of limbs and dual pair of antennae typically associated with these arthropods. Also, the pincer-like cerci seemingly present at the posterior end of its body were much more reminiscent of the abdominal forceps of earwigs and certain other insects than of anything exhibited by a crustacean. 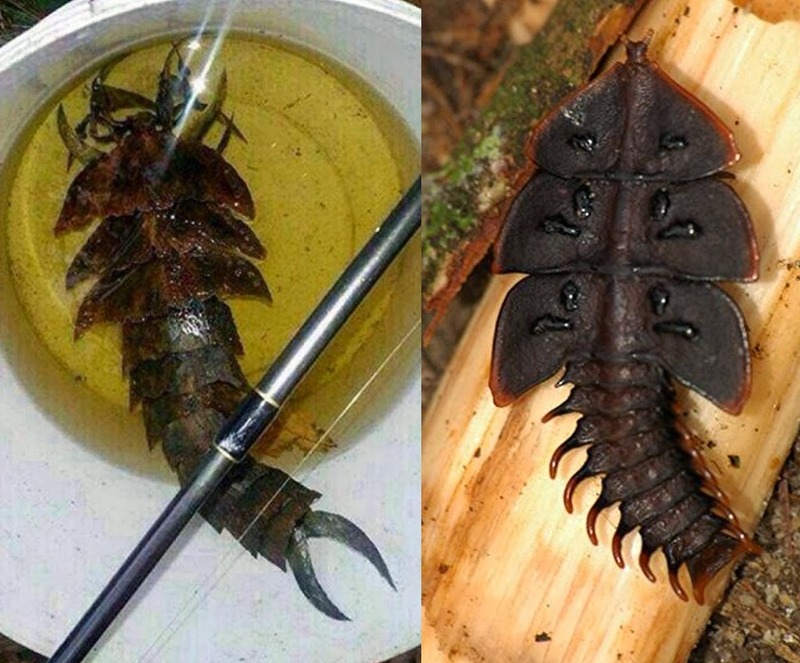 Yet I am not familiar with any form of aquatic insect – adult or larval stage - that is even vaguely similar in appearance to the Beast of Brunei. Could it therefore have been some form of terrestrial insect that had inadvertently fallen into the river and had then been spied and caught by whoever had photographed it? As it so happens, there is a group of terrestrial beetles that do offer at least a superficial resemblance to this mystery animal. Coleopterans belonging to the taxonomic family Lycidae, they are known, for good reason, as trilobite beetles. 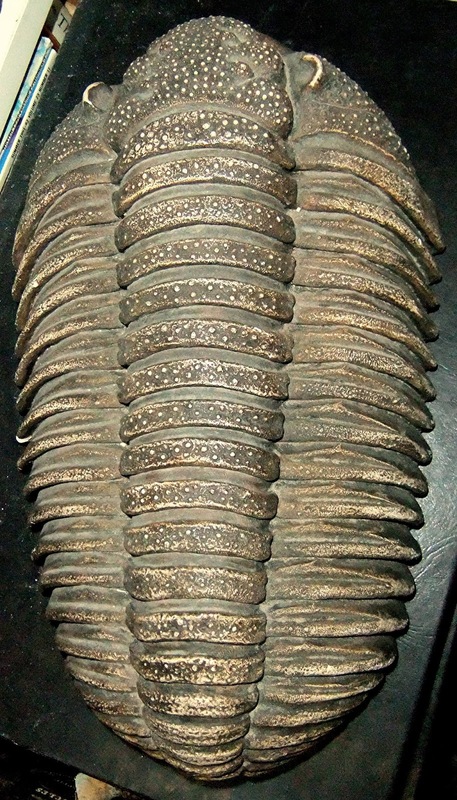 For whereas the adult males are typical-looking beetles (and also fairly small, only around 1 cm long), the much larger adult females (up to 6 cm long) and also the juveniles sport an ornate protective armour of segmented, spine-bearing plates known as scutes that do recall the appearance of those long-vanished prehistoric arthropods the trilobites – and also the Beast of Brunei, as seen in the comparison photograph above. 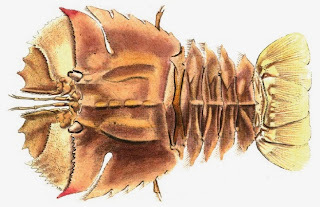 Yet despite spending a considerable time perusing images online of various species of trilobite beetle (insects, incidentally, that do include Borneo within their distribution range), I have failed to find any that provide a convincing correspondence to the Beast of Brunei. 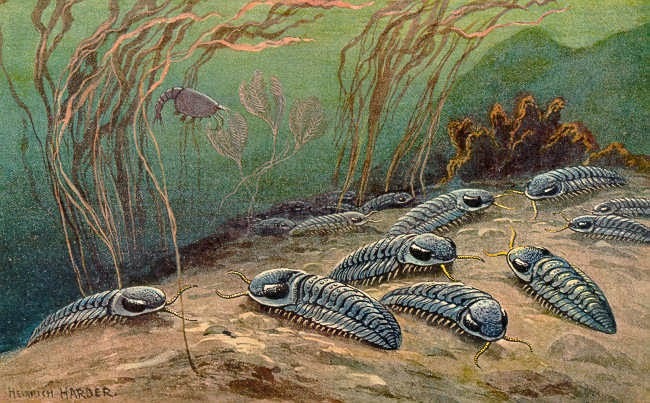 Possibly the closest are those of the genus Duliticola (which is actually named after Borneo's Mount Dulit), but the Beast's body is proportionately too long and slender, and its cerci are unprecedented among trilobite beetles. 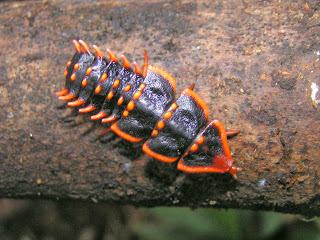 By today, 1 January 2014, the Project Noah page containing Hazwan's Beast photograph had attracted 20 comments from various readers, asking questions concerning the creature and offering some suggestions as to its possible identity, with a possible Duliticola larva being favoured, albeit very hesitatingly, by more than one person. In response, however, Hazwan had merely added that it was a friend (unnamed) who had photographed the animal, that it had been caught in a Brunei river, but that he/she had no further information or photos relating to it. 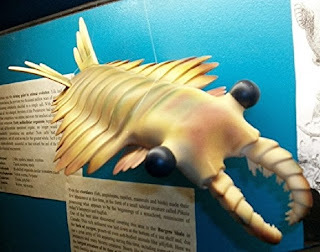 One reader boldly suggested that the creature could be some form of anomalocarid – but as pointed out by Richard S. White (director of the International Wildlife Museum in Tucson, Arizona), those armoured stem arthropods became extinct at least 400 million years ago, at least as far as the fossil record is concerned. Moreover, all known forms were exclusively marine. As for the true trilobites: the last of these iconic if similarly archaic marine arthropods had died out during the mass extinction at the end of the Permian Period, approximately 250 million years ago. It was strange, but from the first moment that I saw Hazwan's photograph, I felt sure that I'd seen something like the Beast of Brunei somewhere before - but where? On 14 December, I'd reposted its photo and Project Noah link from Richard's Facebook wall onto my own, and asked for opinions. 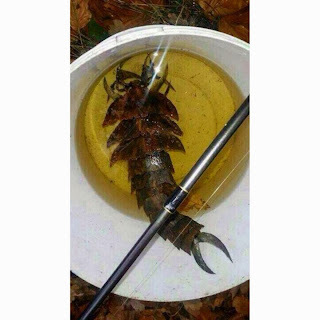 Some FB colleagues shared my view that it was vaguely reminiscent of a trilobite beetle, and there was also some discussion as to whether it might actually be a man-made fishing lure, whose jointed body would presumably wriggle in an animate manner in the river's current and thus attract fishes to it. However, the comments that intrigued me the most were those of Kristian Lander, Blake Smith, and Jonathon Richter, all three of whom independently called to attention its similarity to a small but hideous, much-dreaded creature from science fiction – the ear-penetrating, mind-controlling Ceti eel, which appeared in the second Star Trek movie, The Wrath of Khan, released by Paramount Pictures in 1982. Having seen this film, and at around that time, I now realised that it was a dimly-recollected memory of the Ceti eel that I'd been thinking of when I'd felt certain I'd seen something like the Beast of Brunei before. The Ceti eel appears in the 1982 film Star Trek II: The Wrath of Khan. It is the only indigenous lifeform of Ceti Alpha V known to have survived after Ceti Alpha VI exploded and sent Ceti Alpha V into a different orbit. Ceti eels incubate their larvae between protective plates that line their backs. The slime-covered larva will seek out a larger animal, enter its skull through the ear and wrap itself around the cerebral cortex. This causes the subject intense pain and makes them very susceptible to suggestion. As the larva grows, the host suffers from insanity and eventual death. 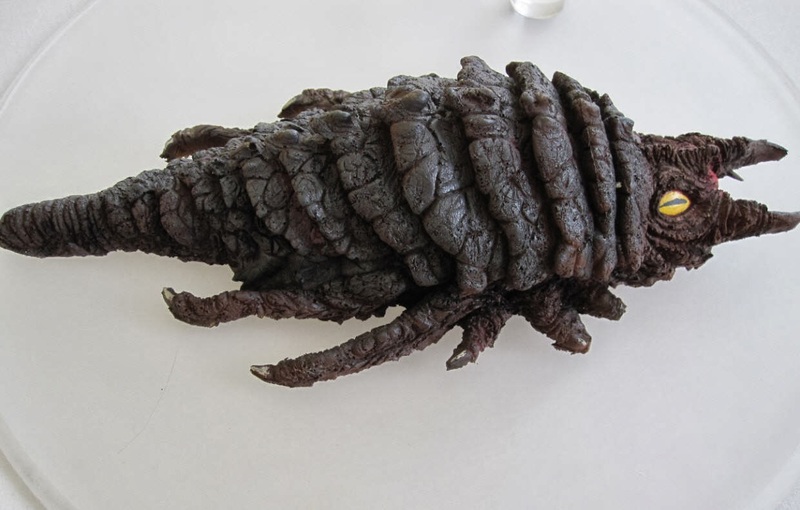 Ceti eels bear a remarkable resemblance to antlion larvae. Even so, it still didn't match the elusive image that I had in my mind – but then, when perusing further illustrations of the Ceti eel online, I finally found it! I discovered that the version of the Ceti eel seen on screen was not the only one that had been conceived. 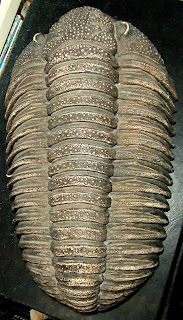 No less than 15 different concept or prototype Ceti eels had been sketched by one of the film's designers, visual-effects artist Ken Ralston from Industrial Light & Magic, yielding a great diversity of forms, and it was the film's producer, Robert S. Sallin, who had made the final choice as to which of these should become the on-screen Ceti eel. 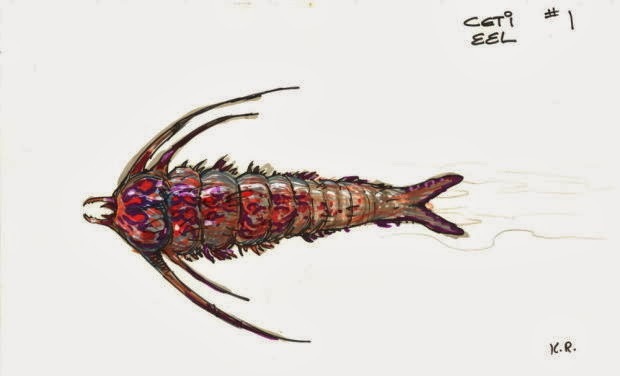 Of the 14 versions that didn't make it, one of them (Ceti eel Concept #11) even possessed a pair of sizeable, grasshopper-like hind legs; and another one, the very first to be sketched by Ralston in fact (Ceti eel Concept #1), sported a pair of posterior earwig-like cerci! Yes indeed, there it was – the image that I knew I'd seen somewhere before and had remembered vaguely ever since. It was none other than Ceti eel Concept #1, deftly combining an armoured body that resembled a somewhat extreme example of an adult female trilobite beetle with those instantly-recognisable terminal cerci that had hitherto foiled every attempt by me to identify the Beast of Brunei. Although the thoracic scute spines on Ceti eel Concept #1 are much lengthier and more attenuated than those of the Beast, it can readily be seen from the above illustration that the former fictitious creature is much more similar to the latter mystery one than any other candidate that has been considered so far. If the Beast of Brunei is an adult female or a juvenile trilobite beetle, then it is apparently a very distinctive, undescribed species, because its armour differs markedly from any species whose morphology I am aware of, and its cerci are unique. Of course, there is the faint possibility that these latter structures are not cerci at all, and even that they are not actually attached to the animal – perhaps they are merely something upon which the animal is resting, because they do appear somewhat misaligned. Alternatively, one FB friend suggested that they resembled the tail of a fish that had been attached somewhat inexpertly to the animal's posterior end. As for the animal's legs and possible antennae visible at its anterior end, these are not sufficiently clear in the photo to enable any detailed comments concerning them to be made. Despite allegedly having been found in a river, the Beast of Brunei does not correspond physically to any known taxon of crustacean. Perhaps the nearest are the so-called Balmain bugs or butterfly fan lobsters Ibacus spp. of Australia, but these are marine crustaceans, not freshwater, and their morphological similarities to the Beast are only very minor anyway. In reality, this anomalous creature does not correspond to any known taxon of any invertebrate. What it does correspond most closely to, conversely, is an imaginary entity created for a science fiction film. So is the Beast an unofficial (albeit skilfully-manufactured) Ceti eel replica? If so, unless it had originally been created as a distinctive, mobile fishing lure, why was it found in a Brunei river? Or was it? Is this enigmatic creature's entire story (if anything with such scant details can even be referred to as a story anyway) no less fictitious than the Ceti eel? That is, could it be that the Beast wasn't found in a river at all, but was an artificial creation photographed (or even photoshopped) by persons unknown, and then utilised as the basis of yet another zoologically-themed internet hoax? If it IS genuine, then its extraordinary, unparalleled combination of morphological attributes suggests that the Beast of Brunei is a truly remarkable zoological discovery of potentially profound scientific significance – and especially so if by extreme good fortune the animal itself has been preserved. But as almost a month has now passed since its internet debut yet without anything further emerging online regarding it, in my opinion the omens for its authenticity do not look good. "We don't even know where to begin to classify this thing. We hope you are able to provide additional information. How large was this thing? Was it caught with a net or a fishing pole? Are there any additional photos showing the underside? Perhaps one of our readers can assist with this identification." I accessed this page most recently during the early hours of today, 1 January 2014, when preparing the present ShukerNature article; at that time, no additional information had been supplied by Hazwan, and no assistance in identifying the creature had been offered by any reader. 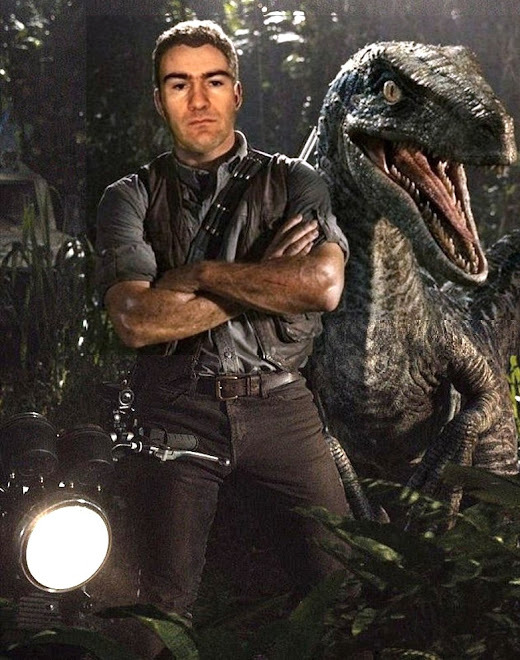 I would love to be proved wrong, but somehow I don't think that we're going to be hearing any more about the Beast of Brunei – or, even if we do, I am not expecting it to shake the foundations of zoology any time soon. Having said that: if anyone reading this ShukerNature post has any pertinent information concerning the Beast of Brunei and/or its possible identity, please do post details below – I'd be extremely interested to read them. Thanks very much! I am most grateful to Richard Muirhead for bringing this intriguing creature to my attention by posting on the Facebook Cryptozoology Group's wall the link to Hazwan's original Project Noah communication; and also to the following persons for their much-valued insights and opinions concerning its possible nature: Kevan Farmer, Kristian Lander, Cameron A. McCormick, Tim Morris, Jonathon Richter, Robert Schneck, Blake Smith, Spencer Thrower, Richard S. White, and Absentia Xuicoatl. Great summary, Karl, very carefully researched - as much as can be for such a tenuous claim. I agree that it certainly isn't any currently known critter. And I think it is about a toss-up as to whether it is real or hoaxed. Real gets some support because, after all, who bothers to hoax a bug that is so close to known critters - if you're going to hoax something, you'd make it a bit more....well, exciting. Hoax gets some support because of the typical nebulous nature of the claim itself - without details or any real engagement on the part of the claimant. I guess we just have to declare, with the Scots: "Not Proven". Hi. Just my observations, the white bucket most probably a plastic paint bucket due to top of pic with the cutout mark for the lid cover to lock when still unopened. The bucket should be about 8inches in wide. Which makes the creature about 12inches long. The water looks brackish also based on coordinate location. This water can harbour sea fish up to 6miles upriver during high tide like trvevally, tarpon, grouper etc.And since the water is kind of clear of any floating materials maybe it was caught during lowest tide in the mangrove tributary. If the tail was attached with a real fishtail, no fish in mangroves has that scythe design tail, which indicates a pelagic fish or open water fish. And seems to have big mandible and body shape doesn't make it a swimmer more like walking like a horshoecrab. Will be hood to see shots from underneath. Thank you for this informative post, Dr Karl Shuker. As an active member of Project Noah, I have been following this spotting and eagerly waiting for any identification updates. Once in a while, there are new users who upload hoaxes and prank prank photographs but we quickly dispose of those. Hazwan have a clean record so far and has never tried to break the site rules. Unfortunately Hazwan is not a very scientific-type of person, otherwise he would have shared more detailed information of this creature or collect it as a specimen for scientists. Borneo is a biodiversity-rich island containing tens of thousands of species waiting to be discovered. I myself have been actively photographing invertebrates that are still undescribed. It is not surprising if this creature turns out to be a new kind of arthropod. I have seen this picture before. It was send to me in november 2013. My friend told me this pic was made by her friend in Sweden. I have also got another picture of this creature, wich show more detail. You can clearly see the size of this creature and with what it was caught and the surroundings where it was caught. And it doesn't look like Brunei. I am trying to post the picture.